I have been using DryRods from Safeguard Chemicals for a couple of years now. Before that I used the Dryzone cream. There is no doubt that the product works and it has recently been given the approval of a German organisation that preserves old buildings and monuments, in addition to its BBA certificate. For those who don’t know, the DryRod method is a cleaner, more efficient chemical damp proof course. Instead of injecting silicone liquid under pressure, the DryRod simply leaches silthane siloxine into the mortar course. The compound is drawn out of the perforated tube by the same capillary action as rising damp, and it follows exactly the same path lining the capillary pathways in the bricks and mortar to form an effective barrier against damp. It is a clever idea that has proved to be the kiss of death for the old hit and miss drill and pump method that wasted materials and made your house stink for weeks. Check out the regular feature we ran last year in conjunction with Safeguard, looking at the homes of the UK thoughout the past 100 years. Click for parts one, two, three or four. Check out some more of Roger Bisby’s reviews here. 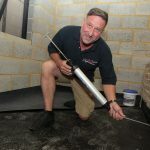 With a 10mm drill bit and a box of tubes I have cured several rising damp problems, but Safeguard has a lot more than DryRods to shout about, and I wanted to delve deeper into the wonderful world of damp prevention. I signed up for their one-day damp proofing course at their headquarters in Horsham, Sussex. I was told the actual course I wanted was fully booked but I persuaded them to squeeze me in. I have been on so many courses that I know a 100 per cent attendance is never going to happen. Builders might be self-employed but they certainly aren’t their own bosses, and when the customer wants the job done it doesn’t matter what other plans you have. So there we were sitting in their tiny training room carved out of the corner of a warehouse. It made for a very intimate gathering and we were all soon chatting freely. This was both good and bad because our anecdotes and questions about damp problems made for a very interesting morning, but they put the presentation way behind schedule. On the course we dealt with the causes of damp in buildings and what to do about them. So often there are mis-diagnoses of damp and sometimes deliberately so. Many people employ specialists rather than leaving their builder to solve the problem simply because they want a piece of paper to keep the mortgage surveyor happy. Safeguard uses an independent third party insurer to provide cover for the work. The next course I am going to attend at Safeguard is the damp in basements course. I am fairly sure I know a lot of it but, as I found with the first course, there are things you know and things you think you know. Avoiding some basic errors and specifying the correct products can save you a lot of wasted effort.